Nuclear energy will gradually decrease but will remain at the centre of France’s energy transition for 2030 and 2050, which was presented on Wednesday (30 July). EURACTIV France reports. The French law on energy transition (30 July) is the “most ambitious in all of the European Union,” claimed Ségolène Royal, the French environment minister who presented the package on Wednesday. The long-awaited law sets targets to increase the proportion of renewable energy to 32% by 2030, reduce CO2 emissions by 40% between 1990 and 2030, and reduce the consumption of fossil fuels by 30% by 2030. It also outlines targets for 2050, such as reducing energy consumption by half and cutting CO2 emissions fourfold compared to 2012, in line with EU-level targets. In terms of financing, Ségolène Royal organised a banking conference in June and secured €10 billion over three years to fund the energy transition. But environment protection organisations argue that €10 billion will not be enough (see positions below). Adopted by the French Council of Ministers on 30 July 2014, the final draft of the energy transition law will be passed on to the French National Assembly and will be scrutinised by a parliamentary committee before it is examined in plenary session on 1 October. Although the French targets for CO2 emissions are the same as those set by the EU Commission, the ambitious targets on renewable energy go above and beyond. The European Commission’s energy and climate package for 2030, presented in January, set out targets to reduce CO2 emissions by 40% compared to 1990 levels and ramp up renewable energies to 27% of the bloc’s energy mix. These targets are Europe-wide, not national, and still need to be endorsed by EU leaders at their October summit. According to Ségolène Royal, the law will make France “the country of environmental excellence” and give it more weight when national leaders debate the Commission’s proposed 2030 targets at the October summit. The discussion promises to be tense considering the diverging views on environmental policy across the 28 member bloc. The summit discussion will carry an additional political element for France. Paris will host the UN’s 2015 climate conference, when governments from developed and developing countries will try to reach a world agreement to reduce global warming. “France must be an example,” said the French minister. On the domestic front, the French law confirms a previous commitment by president François Hollande to reduce the share of nuclear in the country’s energy mix. Indeed, the proportion of nuclear in electricity consumption is set to decrease from 75% currently to 50% by 2025. A report by the electricity grid operator RTE, says nuclear energy accounted for 73.3% of French electricity production in 2013, while renewable energy reached 18.6%. Unlike Germany, which decided to phase out nuclear power in the wake of the Fukushima disaster, French energy production will continue to rely heavily on nuclear. “France has chosen to go with nuclear,” said Ségolène Royal, adding that it will remain the “linchpin of our energy mix”. The law fails to specify how the proportion of nuclear energy will be reduced. 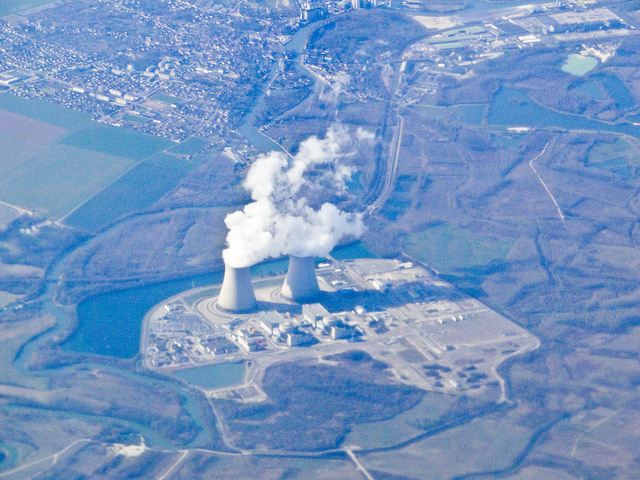 The shutting down of Fessenheim, France’s oldest nuclear plant, has been announced a number of times. But the decision is not part of the law, which merely caps nuclear production at the current level of 63.2GW. This means that the French government will have to close power plants if they want to open a European Pressurised Reactor (EPR) – like the one planned for Flamanville in 2016. "Whether it be regarding medium-term objectives, building renovations, mobility or energy production, the bill makes some progress, but it does not provide the impetus to move towards a more sober energy model, which creates jobs, is closer to territories and pollutes less. We expect the parliament to smother the bill in all these areas," said Réseau Action Climat. “The evolution of the nuclear portfolio is still not clear. Although the goal of reducing the proportion of nuclear in electricity production by 50% is now official, the means to achieve this have been postponed to future and subject to EDF’s goodwill”. "In terms of financing the transition, the minister put the figure at €10 billion over three years in the form of tax credits, energy cheques and funds to support local communities, individuals, businesses and banks, particularly in the energy renovation or transport sectors. ADEME estimated annual funding requirements of an extra €10 to €30 billion" stated the WWF. "The bill introduced today was generally consolidated compared to the version of 18 June, the idea remains the same. The minister shows strong support for renewable energy and wind power, we welcome that," said Frédéric Lanoë, President of France Energie Eolienne. "This is a unique opportunity to show that ecological transition can create hundreds of thousands of jobs and is an opportunity for our economy. This text will be a big part of this five-year mandate and a finally a way to enter the 21st century. But only if it has the means to finance its ambition, which is estimated at €20 billion per year, and changes in tax and the regulatory landscape" said the Nicolas Hulot Foundation. "This small piece of legislation shows ambitious goals that are distant and never supported by means to implement them," said deputy judge, Bertrand Pancher (Meuse). "I back the 40% reduction of CO2 emissions target for 2030 [...] But I believe that the 30% reduction of fossil fuels (coal, gas, oil) target by 2030 is very ambitious. Efforts will be on the gas and oil because France already consumes almost no coal," Gerard Mestrallet, the CEO of GDF Suez, told AFP. The energy transition was central to François Hollande's presidential campaign in 2012. The bill has been long-awaited. France wants to be an example to other countries as it prepares to host the 2015 UN climate conference in Paris. Thanks to its nuclear plants, France has much lower CO2 emissions than coal-dependent countries like Poland or Germany. On the other hand, France has a relatively poor track-record when it comes to energy efficiency. This is a promising development but as some observers note, not enough. France is a country of communes – each could have its own PV plant and wind turbine(s) which would provide alternative power to the mix of nuclear/gas. This will not happen due to vested interests (EdF/ERDF…. erm…. owned by… errr the French state). In terms of “what to do with all the spare nuclear power floating around, the solution is staring France in the face. The UK, France’s neighbour, has convinced itself (well the government and the informal French embassy masquerading as a UK government department called DECC has – the population is less convinced) that they need more power & have latched on to nuclear power as the solution. New nuclear is expensive (£16bn expensive) & furthermore, the UK has not put out any of the nuclear contracts to tender – very very naughty.. So, here is an idea. DG Competition now looking at the UK/DECC submission for Hinkley (3.2GWs of nukes) should require that the contract be put out to tender with a 35year limit and delivery by …. 2020. Currently, the Hinckley project is costed at £16bn. Cross border links running at 3.2GW connecting UK – France would cost around £1bn/GW – based on the fixed price/delivered on time to budget of the Brit-Ned link. So very roughly for 1/5th of the price of a new nuke the UK would get its nuclear power and France would have a long term market for its spare nuclear power. Such an approach would also be in the spirit of the 3rd energy package – which all member states support – don’t they? (well the recent June letter from Poland, Czech Repub, UK etc to Oettinger certainly claimed they did). I’ do hope DG Comp reads the above – we all support tech neutrality (DG Comp claims it does) so why not a tender for 3.2GW of power delivered on a certain date – let the best man/woman win. France doesn’t need to ‘transition’ to anything. They have an ideal power generation system now, Nuclear + Hydro and that is all. The only reason they are even thinking about changing is the influence of the insane Germans. I think they’ll come to their senses before any real damage is done. Probably about the time China is completing reactor # 200. Ah yes – the national approach towards electrical power in Europe – so you would be against any kind of co-ordinated approach to this? i.e. you would be opposed to, for example the 3rd energy package – even though this could deliver lower cost power? What about fusion reactor? Still experimental ? There have just started laying the foundations of ITER in Caradache with completion set for 2023. However when it finally runs it will still at best produce as much power as what is put in to achieve fusion. A Tokamak that can serve as a power generator will have to be a much, much bigger machine again. The real future lies with the construction of a Europe wide interconnecting electricity network.